Phil and I have written about the growing tension between the interests of Moodle HQ and a those of a couple of the bigger Moodle Partners, most notably Blackboard. There are a number of ways that this tension could be resolved, but one of the more dramatic possibilities would be a fork of Moodle. While we are not predicting it will happen, a couple of developments hit the wires last week that give us some idea of what the world might look like if there were a real and permanent split between the two groups. Moodle schools hire Moodle Partners to provide hosting and/or services. Moodle Partners send a portion of their gross Moodle-related revenues (10% in most cases) to Moodle HQ. Moodle HQ then does the substantial majority of development of core Moodle functionality. There is some direct code contribution to Moodle by trusted members of the Moodle community, as overseen by Moodle HQ. All of the cash money and most of the total resource has flowed through the Moodle Partners on its way to HQ. The non-profit Moodle Association provides a second route. Individuals and institutions can join the Association directly by paying a membership fee. That fee buys them votes toward possible Moodle development projects. The projects that get voted up, subject to a feasibility and relevance review by the Association's governing body, get funded for development by HQ using membership dollars. 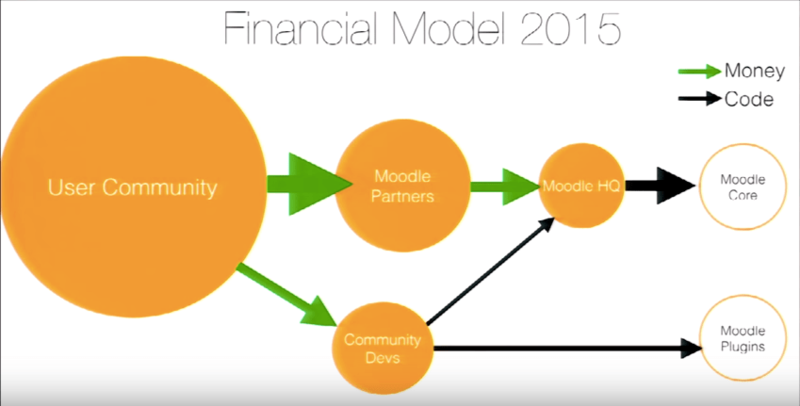 Moodle News has written a post that provides a back-of-the-envelope analysis of the potential for revenue to flow into core Moodle development through this model, comparing the launch of the association to an IPO. It's not a perfect analogy; for example, the revenues aren't really equivalent to the market capitalization of a publicly traded company. But it gives a good example of the kind of math you need to do in order to see how much of an impact the association could have on Moodle development resources, which would be particularly important if one or more of the larger companies were to leave the Partner program. POET’s goals are to help establish a focus for plugin reliability, security, and innovation for the community within the Moodle project....POET’s initial focus will be to help Moodle with improvements to the quality assurance programs for Moodle plug-ins by creating open testing and review processes and tools to be used by the Moodle community. Beyond that, POET plans to improve developer documentation, create new development training resources, create testing environments for high usage/high-performance Moodle installations, and participate in the co-development of new plug-ins focused on integrations with other open source systems. Who are the founding members of POET? The new executive director of POET is Mike Churchward, who also works at Remote-Learner.net. While there is a rationale for a group of large Moodle hosts to collaborate on testing plugins with an eye toward requirements that other Moodle users might not have, this is also clearly a group that is not exactly in perfect alignment with Martin Dougiamas and Moodle HQ. Their decision to go through the Apereo incubation process is interesting. If they were just looking to check the box required by the Open Source license, they could have just put the code up on Github. By applying to Apereo, a non-profit organization run by colleges and universities with an Apache-like multi-project portfolio and incubation process, they are sending a signal that they are serious about doing true community-based open source work and are willing to go through an incubation process to ensure it. Now, this could be nothing more than a good community-oriented business move for the plugin work they wanted to do anyway. But if the group should decide to fork Moodle together at some point, they would have a home for the project that provides them with some open source credibility as well as a community of potential adoptees and participants. In the short term, the big winner in all of this is Apereo. Neither of its predecessor organizations---the Sakai Foundation or the Jasig Foundation---would have been a good fit for POET. But post-merger, the educational focus of the Sakai Foundation combined with the ecumenicalism of the Jasig Foundation have made Apereo a logical home for an open source project of just about any learning tool. POET's selection of the foundation vindicates the merger strategy and raises Apereo's profile as an honest broker and facilitator for educational open source. Hi, correction required. Lambda is a Totara Partner , one of 77 VAR partners worldwide. Totara LMS is developed by Totara Learning Solutions Ltd, not Lambda. Sorry, Richard, that was sloppy of me. I have corrected it.